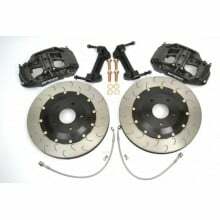 Big Brake Kits There are 19 products. 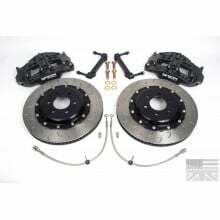 AP Racing big brake kits use piston sizes that are carefully chosen for proper brake bias. 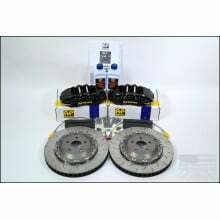 There is special care taken on front only systems to maintain the needed perfect balance of OEM rear, but still have a perfect relationship with your OEM ABS and master cylinder. All this while being a bolt-on kit that most people can install in an afternoon. AP Track Only Brake Kits fall into two categories, Competition and Radi-Cal. AP Competition is truly that, a track only race worthy set-up ready to take you to your next podium. AP Radi-Cal is another way of saying, "The Best Of The Best". 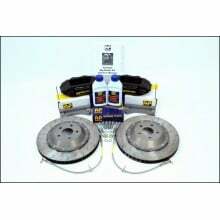 The AP Radi-Cal brake kit is for the racer who needs the lightest, stiffest, best cooling brake caliper and rotor system. RadiCal is what you see on the pro teams car in the longest of endurance races. 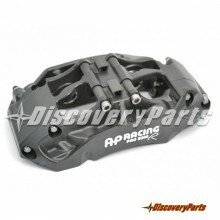 AP Racing Competition big brake kits use piston sizes that are carefully chosen for proper brake bias. 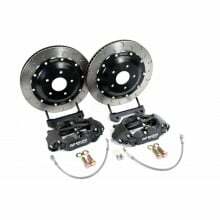 There is special care taken on front only systems to maintain the needed perfect balance of OEM rear, but still have a perfect relationship with your OEM ABS and master cylinder. All this while being a bolt-on kit that most people can install in an afternoon. 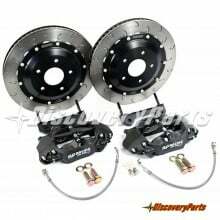 AP Racing | Big Brake Kits |Performance & Competition - DiscoveryParts AP Racing provides world class big brake kits, that fit factory and aftermarket cars for both street and track use. AP Racing is a world leader in performance brake systems and components.